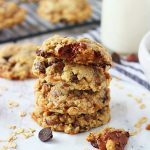 Caramel Pretzel Chocolate Chip Cookies are absolutely delicious and totally loaded with caramel, pretzel pieces and lots of chocolate chips! These cookies have become a favorite treat at our house! They bring us a box of freshly made cookies every Monday, and it takes all the will-power I have to not grab one, every time I walk into our break room. It’s like cookie torture whenever I go to re-fill my water cup. Now that I’ve been working out and eating healthy, it does get a little easier to over look the cookies, but the thought of eating one still lingers in the back of my mind sometimes. 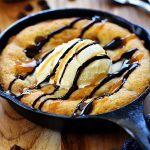 I decided that on my ‘cheat day’ last Sunday, I better make some cookies to fulfill that cookie craving. I went with these salty-sweet Caramel Pretzel Chocolate Chip Cookies. Oh man, were they divine. Especially, warm! I ate two, which totally satisfied my craving. They are my new favorite cookie, without a doubt! Cream butter and sugars together in a stand mixer or in a medium bowl, using a hand mixer, for 1 minute. Add vanilla and egg. Mix to combine, scraping sides. In a seperate small bowl, combine flour, salt and baking soda. Whisk together to combine, and then gradually add to the wet mixture. Mix until just combined. Stir in broken pretzel pieces, caramel bits and chocolate chips. 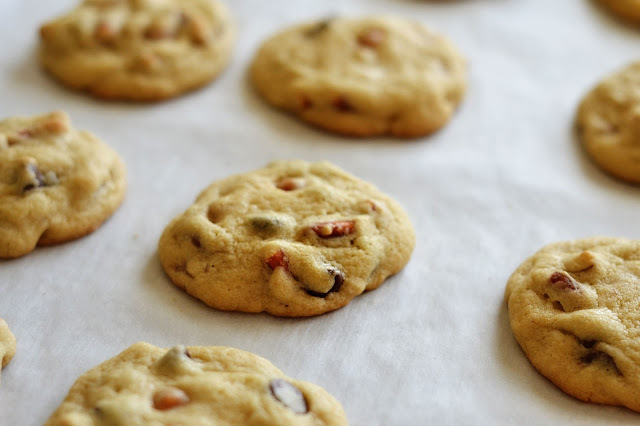 Scoop tablespoonfuls of dough onto a cookie sheet lined with parchment paper. Spacing dough apart at least 2 inches. Bake 10-12 minutes, or until edges are slightly golden-brown. 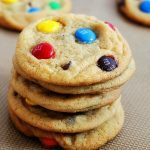 Remove from oven and let cool 5 minutes before transferring to a cookie rack. good thing it makes a small batch, I could easily eat a lot of these! I have zero willpower right now. It is gonna stink losing the baby weight! 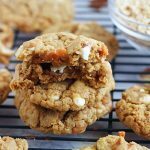 So good for you resisting cookies! These look so good! I would have the hardest time not grabbing a cookie ever time too!!! 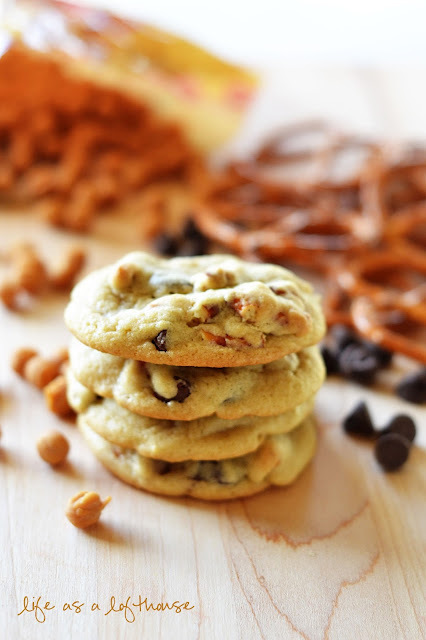 I love caramel and pretzel in cookies…so it is taking a lot of will power right now not to go make some of these NOW!!! YUM!!! 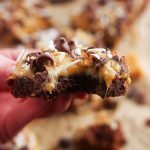 This just may be the perfect cookie! Yeah, well I’m on a diet too. Cookies aren’t all that appealing to me and I haven’t had one in months. 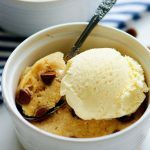 With that said I just wanted to let you know that the picture of the cookie dough you posted has got me SO craving a big ‘ol spoonful (or two) of cookie dough! Your cookies look absolutely perfect too by the way. Your amazing as always! Thanks for all the delicious recipes and dinner ideas! Omg….yuuummmyyy!! Where do you find the caramel bits?? Thanks for leaving a link back to my blog 🙂 Glad you liked the cookies! This here Cookie Monster declares these luscious bites…TO.DIE.FOR! Swoon!! I know I couldn’t possibly stop eating them if I had a platefull in front of me. SO glad you shared. Cookies in the break room is just evil. 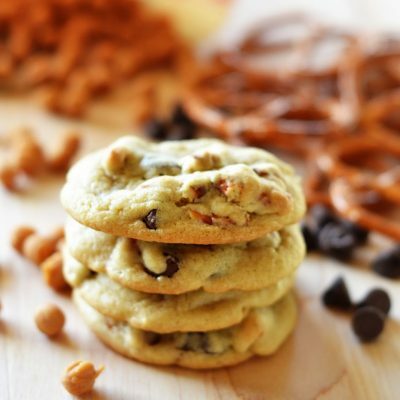 🙂 I love salty and sweet together so pretzels in the cookies sounds amazing to me! We didn’t like these cookies, the minute they cooled down the caramel bits got hard and were difficult to chew for my little grandsons. Holly – Wanted you to know I’m featuring this wonderful recipe as my personal favorite at Weekend Potluck. (Those caramel bits get me every time!=) Thanks for sharing – don’t forget to grab your Featured Button. Have a great weekend.